Today was a very foodful day. It was Jeff’s last day. Jeff had started work at the company almost at the same time I had. I think there wasn’t more than a month between us. But after 10.5 years he was ready to find another challenge… in the form of some time off with his Steam account. It’s hard not to be envious. In the morning one of the other developers had brought in a home-made cake with cream and mashed fruit. I’m calling it breakfast. Over this aforementioned cake I took some time to “supervise” as Jeff, his wife and the graduate were setting up tables in the biggest conference room in the building. Which brings me to food-the-second… lunch. Jeff has many-a-time organised an impromptu lunch. When the boss was up from Melbourne. When a co-worker was up from Melbourne. When it wasn’t raining. When it was raining. It really was just an excuse to get pizzas into the building (specifically an excuse for him to order a Thai Foon pizza). This time the crowd was a little larger than our usual developer-crowd. Instead of fitting 12-15 people in a room, we were looking for space for 60+. A lot of people like Jeff. I was unusually modest in my lunch-intake; there were 6 salads, stacks of portuguese chicken, chips and I think about 8 flavours of pizza, stacked 2-4 pizzas deep in each flavour. It’s easy to get greedy when faced with that much food. The day was rounded out with an afternoon tea-with-cake. This is that special occasion where the soon-to-be-departed is relentlessly mocked over anything and everything noteworthy during their tenure. As much as we kid about everything he touches breaking, it is really the most horrific exaggeration ever. He’s produced some amazing results over the years, and if not for him, the most recent project wouldn’t have gone anywhere as smoothly as it did. It’s a great loss to us… but the only alternative to keep him I could think of was to sedate him and chain him up in the basement. I’m told this is unethical. I’m saving that for later… I think. 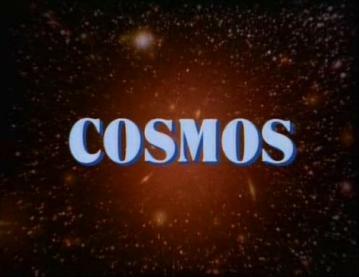 I bought the DVD box set of the original 1980’s show in which Carl Sagan takes a journey through the cosmos. Reading descriptions of this show on websites had made me want to buy it many times in the past… and I never quite did. I have so far only seen the first episode. It’s definitely a show of the 80s. There is the ubiquitous synthesizer music in the background (Vangelis). There is CGI that is both remarkably dated, yet remarkably good for its time. And there are the interspersed people shots with the ridiculous glasses and hairdos and clothing. …none of that seems to matter once you get caught up in Sagan’s flowing monologue. He most definitely has a way with words. And although the CGI available at the time must have been limiting, the way some of the shots are set up are very cleverly done. Especially the cosmic calendar at the end of the first episode gets used very effectively to convey a sense of scale about the age of the universe and our civilizations’ miniscule foothold on the end of the last minutes of the last day. Scale is often the hardest part of science. Some of the numbers science comes up with are just too hard to grasp purely intellectually. The distance between the galaxies. The energy contained within an atom. Even something as intuitively relate-able as a cloud is so much more immense and overwhelming once you fly through it on a plane. And that’s the really easy stuff. Our human minds are just wired with too over-inflated a sense of our own significance. I can’t wait for episodes 2-13. And then to do it all over again with Neil deGrasse Tyson at the helm. Although I could already hear him in the back of my head when Carl called Pluto a planet.